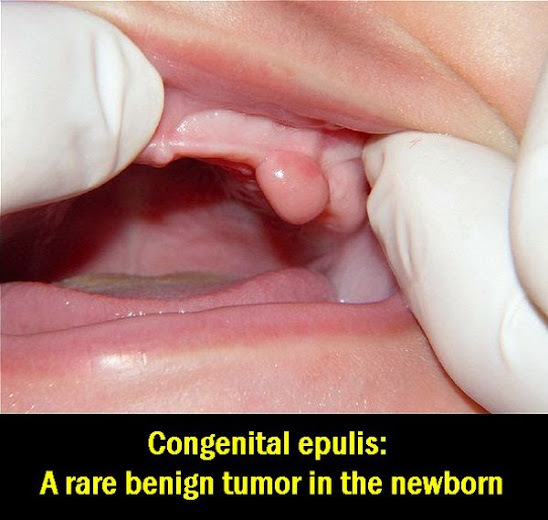 Congenital epulis (CE) of the newborn is a rare benign soft tissue tumor that presents at birth. It occurs usually as a single mass with various sizes, although some multiple lesions have also been reported. The lesion is more common in female neonates and normally affects the maxillary alveolar ridge. Rare recurrence and no malignant alteration have also been reported. This condition may interfere with respiration, feeding or adequate closure of the mouth. A decisive diagnosis is made by histopathologic analysis as other newborn lesions can be incorrectly diagnosed as CE. This article presents a case report of a female infant who presented a fibrotic mass in the primary lateral incisor and canine region of the maxillary alveolar ridge. The lesion was not causing feeding or respiratory problems. After a watchful waiting procedure and no spontaneous regression, the lesion was excised under local anesthesia and confirmed by histopathologic analysis as CE. Congenital epulis (CE) of the newborn is a rare benign tumor of the soft tissues, which normally affects the maxillary alveolar ridge in neonates. The exact pathogenesis of CE is still uncertain, as is its growth and progression. It is normally diagnosed at birth, but there are some cases in which diagnosis can be made on the third trimester pre-natal. The recommended treatment for CE is prompt surgical excision due to interferences with feeding, respiration or adequate closure of the mouth. Although some cases of CE have been reported in the literature, it is important to allow pediatric dentists to be aware of this congenital tumor and its presentation, differential diagnosis, treatment and histopathology.